Finding the perfect bassinet bedding set for your nursery is one of the many pleasures in creating a place for your newborn. Some bedding sets also include the actual bassinet, so be sure to read the full description to understand what all is included. Every retailer will have a different variety available, so be sure to check out several to find the perfect set for your baby's bassinet. This upscale baby and child boutique that has an extensive reputation for amazing customer service. USA Today's 10Best says that "San Antonio parents are lucky to have Sugarplum Dreams in their city. This store is often referred to as 'the ultimate baby and children's boutique.'" If you don't live near San Antonio, you can still shop the great finds via its online Yahoo store. Customer testimonials: Customers rave about their shopping experiences remarking about the staff's friendliness. Other customers are impressed with the one-on-one service above the call of duty. There area several designer bassinet bedding sets for sale from this upscale boutique. They are made from very luscious fabrics, such as Pima cotton, silk, organza and seersucker. The bassinet sets are available in both gender specific and gender neutral. 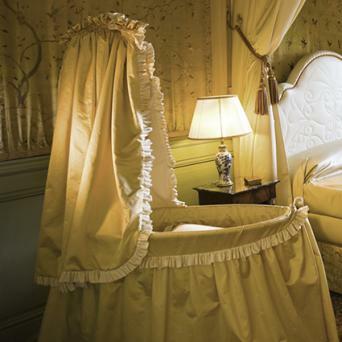 The sets typically include the bassinet itself and mattress, along with matching bedding featuring underskirt, sheet, and decorative pillow. Bassinet bedding set prices range from $500 to over $1,600. Shipping: Many items offer free shipping, such as free shipping for orders $100 or more. Returns and exchanges: In-stock items can be returned for an exchange or refund within 14 days of receipt with authorization. Even in-store returns must have prior authorization. Cancellations: Custom orders can be canceled up to two business days. After that time, custom orders cannot be refunded. aBABY offers a wide assortment of unique bassinet bedding set choices from moderately priced at around $150 to truly opulent sets that cost over $1,700. In addition to typical bassinet style bedding choices, aBABY also offers Moses basket styles of bassinets and bedding sets. High customer satisfaction: aBABY customers comment that the bassinet sets are "much more beautiful than pictured," "excellent quality," and "nicely made and good quality fabric." Hands-on service: Customers also sing praises to the customer service for assisting them in ordering the right size for various bassinets customers already owned -- including a few vintage styled bassinets. This type of hands-on service sets aBABY apart from similar companies. Personalization: Some of the bassinet sets offer personalization with your baby's name embroidered on the bumper. The Moses basket allows you to go beyond just the name of your baby by adding one of several cute appliques. Advice and tutorials: Learn how to both assemble your bassinet and how to choose the right bedding sizes for the bassinet. The Simply Delicate Dupioni set comes in pink, blue, and green. It has everything included from the bassinet itself to the hood, skirt, mattress protector, sheet, and mattress itself. Personalization is available on this machine washable set. 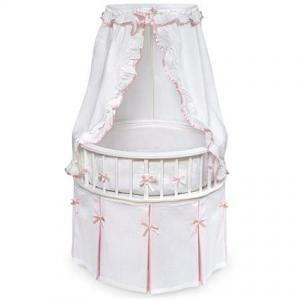 The Little Angel bassinet set is sewn in two-tiers and features a ruffled hood. Colored ribbons are woven through the eyelet embroidery for a stunning effect. This poly/cotton bedding is available as a bassinet set or individual items can be purchased. A special feature of this and other bassinets also includes an adjustable frame that allows you to convert the bassinet into a cradle. The Dots Baby Lounge to Go is a portable combination of a crib, bassinet, and play mat. The cover has a canopy and is available in a natural color, blue Swiss dot and pink Swiss dot cotton fabrics. Shipping: Many of the bassinet sets offer free ground shipping but check before ordering. Returns: Items can be returned within 30 days of receipt for either a refund or exchange. Customized and personalize items aren't returnable. Damaged or incorrect shipments are returnable within seven days of receipt. Digital images may be requested before authorization granted. Restocking fee: Larger items are charged a 15% restocking fee. 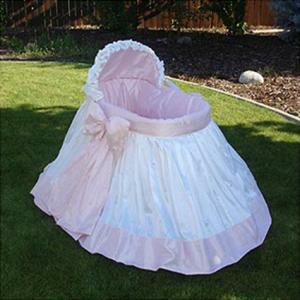 There are numerous individual shops on Etsy that offer hand-made and custom-made bassinet sets. You'll find a wide price range as well as style and personalization options. Some shops have a limited number of sets available while others are made-to-order only. Many of the shops feature the handiwork of true artisans that isn't available in Big Box stores. Individual shops have specific return, shipping and cancelation policies, so be sure to read all the information before placing an order. The Martika Shop presents many different bedding pieces for bassinets and cribs, including sets. For example, the 4-piece Mossy Oak Bassinet Bedding Set is available in a 32-inch round shape and sells for $225. You can also order this set in an oval. The set includes the canopy, bumper, fitted sheet and ruffled skirt. Customers are highly satisfied with their purchases, commenting on the quality of the products and "great service". One customer purchased the Mossy Oak set and commented, "Love Love Love my baby bedding...did an awesome job!!! Sheets fit perfectly." The shop's policies aren't listed, so it would be advisable to email inquiring about returns, cancelations, and other concerns, prior to making a purchase. Most of the Big Box stores like Walmart carry man of the top brand bassinet bedding labels. These can be purchase in-store or many can be found online. The reviews for these and other bassinet bedding products vary from product to product. Most people are familiar with Walmart and have shopped at a store or ordered online. While you can find many of theses items locally, you may prefer the convenience of online shopping. Some of the bassinet sets are portable bassinets and some include a shelf or toy box base for handy storage. These include Badger Basket, Delta Children's Products, and Arm's Reach, and no-frills contemporary styles from manufacturers such as Kidco, Evenflo and Baby Trend. The sets vary in what's included, so be sure to read the descriptions to understand what you're buying. Unlike boutique and custom, hand-made sets, these are more economical from $49.98 and up. Shipping: Most online items have two options for shipping: free on orders over $50 and free in-store pickup. Returns: Returns can be done within 90 days of receipt, by mail or at the store. Check the online list for exceptions. Whether you choose to shop a Big Box store or opt for a baby boutique shop or individual artisan shop, you have many options when it comes to bassinet bedding sets. You are sure to find the ideal set with a little research.